Yadier Álvarez (born March 7, 1996) is a Cuban baseball pitcher for the Los Angeles Dodgers organization. Ranked as the second best prospect by mlb.com heading into the 2015 international signing period, Álvarez signed with the Dodgers on July 2, 2015, for a $16 million bonus. Chris Anderson (born July 29, 1992) is a professional baseball pitcher in the 2013 Major League Baseball Draft, and he signed with the team on June 12, 2013, for a signing bonus of $2,109,900. Anderson attended Centennial High School in Blaine, Minnesota, where he was a two-year starter as a pitcher and first baseman. As a senior he went 6–1 with a 1.86 ERA while batting .437. He was named All-Conference, All-State, was Minnesota's contender for Gatorade Player of the Year, and was named Minnesota's Mr. Baseball award winner for the 2010 high school season. He was also a two-year starter at quarterback for the football team. The Chicago Cubs drafted him in the 35th round of the 2010 MLB Draft, but he did not sign. Anderson attended Jacksonville University. As a Junior he went 7–5 with 101 strikeouts and a 2.49 ERA in 104 2/3 innings. He was the first player from Jacksonville U to be selected in the first round of the Major League Baseball Draft. He made his professional debut with the Great Lakes Loons of the Midwest League on June 26, 2013. He made 12 starts with the Loons in his debut season, and was 3–0 with a 1.96 ERA. 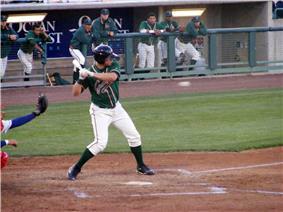 Anderson was promoted to the Rancho Cucamonga Quakes of the California League for 2014. In 27 games (25 starts) for the Quakes, he was 7–7 with a 4.62 ERA. His 146 strikeouts on the season was tops among all Dodger minor leaguers. The Dodgers invited him to attend major league spring training in 2015. He was assigned to the AA Tulsa Drillers of the Texas League to start the 2015 season and was named to the mid-season All-Star team. He made 23 starts for Tulsa and was 9–7 with a 4.05 ERA. He was promoted to the AAA Oklahoma City Dodgers in late August for a try out in the bullpen with the potential to be promoted to the majors in a bullpen role. He appeared in three games for them and allowed 15 runs in 6 1⁄3 innings and was not called up. Cody James Bellinger (born July 13, 1995) is an American professional baseball first baseman in the Los Angeles Dodgers organization. Bellinger was drafted by the Los Angeles Dodgers in the fourth round of the 2013 Major League Baseball Draft out of Hamilton High School in Chandler, Arizona. He signed with the Dodgers and made his professional debut with the Arizona League Dodgers. In 2014 he played with the Ogden Raptors and Arizona League Dodgers. He played in 2015 with the Rancho Cucamonga Quakes and was selected to the mid-season California League all-star team as well as the post-season all-star team. In 128 games, he hit .264 with 30 homers and 103 RBI. His father, Clay Bellinger, played in Major League Baseball (MLB). 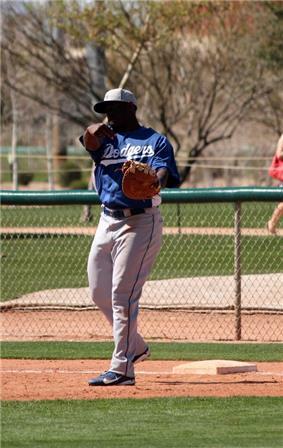 Jharel Leandre Cotton (born January 19, 1992) is a professional baseball pitcher in the Los Angeles Dodgers organization. Cotton played college baseball at Miami Dade College in 2010 and 2011. After he was not taken in the 2010 Major League Baseball Draft, the Los Angeles Dodgers offered him a contract as an undrafted free agent, but he declined the offer and returned to Miami Dade. He was then drafted by the New York Mets in the 28th round of the 2011 MLB Draft, but did not sign and transferred to East Carolina University. After one year at East Carolina, Cotton was drafted by the Dodgers in the 20th round of the 2012 MLB Draft. He signed this time and made his professional debut with the Ogden Raptors. Cotton spent 2013 with the Great Lakes Loons, Rancho Cucamonga Quakes and Double-A Chattanooga Lookouts. Cotton missed the first two months of the 2015 season, recovering from a broken left wrist. He pitched in one game for the Great Lakes and four for Rancho Cucamonga before being promoted to the Double-A Tulsa Drillers. In late August, he was promoted to the AAA Oklahoma City Dodgers and tried out for a potential bullpen callup to Los Angeles. Between the four levels he appeared in 21 games (with 11 starts) and was 6–2 with a 2.45 ERA. Chase Louis De Jong (born December 29, 1993) is an American professional baseball pitcher in the Los Angeles Dodgers organization. De Jong played for Woodrow Wilson High School, and was drafted by the Toronto Blue Jays in the 2nd round of the 2012 Major League Baseball Draft. After signing for a bonus of $620,300, De Jong was assigned to the Gulf Coast League Blue Jays and made 6 relief appearances for the team, posting a 1–0 record with a 1.50 earned run average and 15 strikeouts over 12 innings, with only 1 walk. He was promoted to the Bluefield Blue Jays prior to the start of the 2013 season, and made 13 appearances for the team, 10 of which were starts. In 2013, De Jong posted a 2–3 record with an ERA of 3.05 and 66 strikeouts over 56 innings pitched. In 2014 he was promoted to the Class-A Lansing Lugnuts. De Jong made 23 appearances for Lansing in 2014, 21 of which were starts, and compiled a record of 1–6 with a 4.82 ERA and 73 strikeouts in 97 innings pitched. De Jong started the 2015 season in Lansing, making 14 starts and posting a 7–4 record, 3.13 ERA, and 77 strikeouts in 861⁄3 innings. He was traded to the Los Angeles Dodgers on July 2, 2015 for cash. 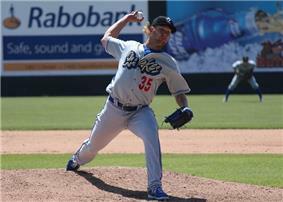 In 11 appearances (10 starts) for the Rancho Cucamonga Quakes he was 4–3 with a 4.86 ERA. He struck out six in six innings for the Quakes in the opening game of the California League championship series. He is the cousin of former Blue Jays pitcher Jordan De Jong. O'Koyea Dickson (born February 9, 1990) is an American professional baseball player in the Los Angeles Dodgers organization. Dickson attended College of San Mateo, where he was an All-American as a sophomore and helped lead his team to consecutive league titles. For his junior year, he transferred to Sonoma State University. He led the California Collegiate Athletic Association in runs scored and helped take his team to the NCAA Division II Baseball Championship. He was drafted by the Dodgers in the 12th round of the 2011 MLB Draft. He spent 2011 with the Ogden Raptors and 2012 with the Great Lakes Loons. He hit .280 with 15 homers and 88 RBI in 2013 with the Rancho Cucamonga Quakes of the California League. In 2014 he played with the AA Chattanooga Lookouts of the Southern League, where he hit .269 with 17 homers and 73 RBI and scored an invite to spring training for 2015. He was assigned to the AAA Oklahoma City Dodgers. He appeared in 117 games and hit .262 with 12 homers and 50 RBI. Yadir (Dominguez) Drake (born April 12, 1990) is a Cuban professional baseball outfielder in the Los Angeles Dodgers organization. Drake played for the Matanzas team in the Cuban National Series. He defected to Mexico in 2011. He then played with a couple of semi-professional minor league teams in Mexico before participating in a workout for Major League Baseball scouts in August 2014. He was signed as an international free agent by the Los Angeles Dodgers. He hit .310 in seven games for the class-A Great Lakes Loons of the Midwest League at the start of the 2015 season and was promptly promoted to the Advanced-A Rancho Cucamonga Quakes of the California League. After another seven games for the Quakes (where hit .407) he was again quickly promoted, this time to the AA Tulsa Drillers of the Texas League. In 196 games for Tulsa, he hit .269. James Kyle Farmer is an American professional baseball catcher for the Los Angeles Dodgers organization. Farmer attended  He was drafted by the New York Yankees in the 35th round of the 2012 MLB Draft but did not sign and then was drafted by the Los Angeles Dodgers in the 8th round of the 2013 MLB Draft and signed. He also played quarterback on the high school football team and had a cameo appearance as the high school quarterback in the movie The Blind Side. He made his professional debut with the All-Star Futures Game in 2015. He played in 76 games for Tulsa and hit .272. Pablo Millán Fernández Rojas is a Cuban baseball pitcher for the Los Angeles Dodgers organization. Fernández played for Holguín of the Cuban National Series as a relief pitcher. He defected from Cuba in July 2014, and agreed to sign with the Los Angeles Dodgers in March 2015 for a reported $8 million signing bonus. A formal signing was held up as he awaited a visa to travel to the United States and take his physical, which was finally approved on May 11. he officially signed with the Dodgers on May 19. He pitched in 10 games in the Dodgers farm system in 2015, (with the Arizona League Dodgers, Great Lakes Loons and Rancho Cucamonga Quakes) and was 3–2 with a 3.92 ERA. Juan Pablo González (born April 5, 1990) is a Venezuelan professional baseball pitcher in the Los Angeles Dodgers organization. González played in the Los Angeles Dodgers. In 2015 he began the season with the Tulsa Drillers and was later promoted to the Triple-A Oklahoma City Dodgers. He was selected to play in the All-Star Futures Game. Between Tulsa and Oklahoma City, he appeared in 31 games with a 2.18 ERA. Kyle Jensen (born May 20, 1988) is an American outfielder in the Los Angeles Dodgers organization. He primarily plays right field, but has played left field and first base. Jensen attended St. Mary's Preparatory School in Stockton, California. He was drafted by the Florida Marlins in the 12th round of the 2009 MLB Draft out of St. Mary's College of California. He was added to the 40-man roster on November 20, 2012. In 2013, he started the year at Jacksonville before being promoted to New Orleans. With Jacksonville, he hit .237, with 16 doubles, 16 homers, 42 RBIs, and 5 stolen bases. With New Orleans, he hit .233 with 15 doubles, 12 homers, 36 RBIs, and 1 stolen base. Jensen started the 2014 season at New Orleans, hitting .260 with 27 homers, 92 RBIs, and 1 stolen base. Jensen was traded to the Los Angeles Dodgers on November 17, 2014, in exchange for a player to be named later or cash considerations. On December 15, the Dodgers sent minor leaguer Craig Stem to the Marlins to complete the transaction. He was designated for assignment by the Dodgers on December 19 but cleared waivers and was outrighted to the AAA Oklahoma City Dodgers. The Dodgers invited him to attend major league spring training in 2015 but he spent the season with Oklahoma City. In 228 games, he hit .259 with 20 homers and 71 RBI. Kehrt was selected by the Boston Red Sox in the 47th round of the 2008 MLB Draft out of University of Southern Indiana. He is very confident on the mound and can be best described as a finesse pitcher with a very good control who attacks hitters. He throws his four-seam fastball comfortably in the 91 mph range and can even touch 93 mph. His two-seam fastball sits around 87–88 mph with a harder tail than his four-seam, which also mixes in a mid-80s splitter with nice sink and a 77–80 mph slider, giving him four pitches that he will use to work hitters and keep them off balance. Kehrt opened 2014 at Triple-A Pawtucket Red Sox. On August 10, 2014, he was traded to the Los Angeles Dodgers and assigned to Double-A Chattanooga Lookouts. He was assigned to the AA Tulsa Drillers of the Texas League to start the 2015 season and was named to the mid-season All-Star team. He made 22 starts for Tulsa and was 7–8 with a 4.14 ERA. Tyler William Ogle (born August 9, 1990 in Portland, Maine) is a minor league baseball first baseman currently in the Los Angeles Dodgers organization. Prior to playing professionally, he attended Canyon High School and then University of Oklahoma, where – in 2011 – he was named a Big 12 Conference All-Star, a 3rd-Team College All-American and a semi-finalist for the Johnny Bench Award. He was drafted by the Dodgers in the 9th round of the 2011 Major League Baseball Draft and signed for a bonus of $100,000. After hitting .167 his first professional season, he hit .340 with a .432 on-base percentage and a .590 slugging percentage in 43 games between the AZL Dodgers, Ogden Raptors, Great Lakes Loons and Triple-A Albuquerque Isotopes in 2012. He followed that with a .252/.401/.389 line and a league-leading 96 walks for the Loons in 2013, earning a spot on the Midwest League Mid-Season All-Star team. That year, the Dodgers director of player development, DeJon Watson, ranked him among the Loons' top prospects. He played in only 83 games in 2014, posting a .383 on-base percentage for the Rancho Cucamonga Quakes. He also spent time as a catcher and a designated hitter. He was selected to the post-season California League all-star team in 2015 after he hit .263 in 111 games with 20 home runs and 75 RBI for the Quakes. Jordan Mark Paroubeck (born November 2, 1994) is an American professional baseball player in the Los Angeles Dodgers organization. Paroubeck was drafted by the San Diego Padres in the second round of the 2013 Major League Baseball Draft out of Serra High School in San Mateo, California. He signed with the Padres rather than play college baseball. After not playing in 2013 due to a small labrum tear in his throwing shoulder, Paroubeck made his professional debut in 2014 with the Arizona League Padres. On April 5, 2015 he was traded, along with Carlos Quentin, Cameron Maybin and Matt Wisler to the Atlanta Braves for Craig Kimbrel and Melvin Upton Jr. On July 2, 2015, he was traded to the Los Angeles Dodgers (along with Caleb Dirks) in exchange for an international bonus slot. He split the 2015 season between the Arizona League Dodgers and Ogden Raptors, hitting .331 in 35 games. Jacob Alan Rhame (born March 16, 1993) is an American professional baseball pitcher in the Los Angeles Dodgers organization. Rhame attended John H. Guyer High School in Denton, Texas and committed to the University of Oklahoma to play college baseball. After one year, he was cut from the Oklahoma Sooners baseball team and he transferred to Grayson County College. Rhame was drafted by the Los Angeles Dodgers in the sixth round of the 2013 Major League Baseball Draft. 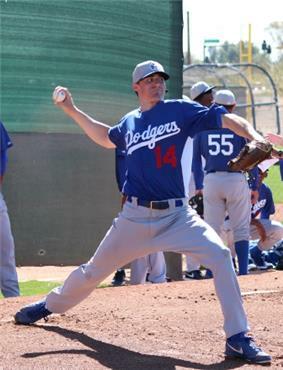 He signed with the Dodgers and made his professional debut with the Ogden Raptors. In 2014, Rhame played for the Great Lakes Loons. He appeared in 51 games and had a 2.01 earned run average (ERA), 90 strikeouts and nine saves over 67 innings. Rhame was assigned to the Rancho Cucamonga Quakes of the California League to start the 2015 season. He was later promoted to the AA Tulsa Drillers, where he was 3–3 with a 3.06 ERA in 39 games. Thomas Ross Stripling (born November 23, 1989) is an American professional baseball pitcher in the Los Angeles Dodgers organization. Strippling played college baseball at Texas A&M University. He threw a no-hitter against San Diego State on May 12, 2012. Stripling was drafted by the Colorado Rockies in the ninth round of the 2011 Major League Baseball Draft, but he did not sign. He was then drafted by the Los Angeles Dodgers in the fifth round of the 2012 Major League Baseball Draft. He was promoted to Double-A Chattanooga Lookouts in May 2013. He was selected to the mid-season Southern League All-Star Game and finished the season 6–4 with a 2.78 ERA in 21 games (16 starts). Stripling was given a non roster invitation to spring training in 2014, but came down with a sore arm after his first game action. He turned out to have a torn ulnar collateral ligament in his elbow. He underwent Tommy John surgery, causing him to miss the entire season. He rejoined the AA Tulsa Drillers in mid-season and finished 3–6 with a 3.88 ERA in 14 starts. Michael David Thomas (born January 6, 1989) is a professional baseball pitcher in the Rider University and was drafted by the Dodgers in the 35th round of the 2011 MLB Draft. In 2011, he pitched in 18 games split between the Arizona League Dodgers and the Ogden Raptors and was 2–3 with a 4.58 ERA. In 2012, he slit time between the Great Lakes Loons and the Rancho Cucamonga Quakes and was 4–2 with a 1.59 ERA in 47 appearances. 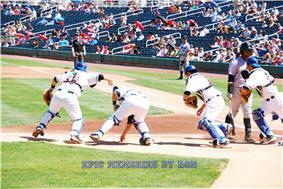 For the 2013 season he again split time between two teams, this time with the Quakes and the AA Chattanooga Lookouts. He was 1–1 with a 2.87 ERA in 45 games, with 11 saves. In 2014, he spent the whole season with the Lookouts and was 4–3 with a 2.73 ERA in 48 games. After the season, he played with the Glendale Desert Dogs in the Arizona Fall League. He was assigned to the AA Tulsa Drillers of the Texas League to start the 2015 season. with Tulsa he was 1–1 with a 4.50 ERA in 28 games. Alex Brady Verdugo (born May 15, 1996 in Tucson, Arizona) is an American professional baseball outfielder for the Los Angeles Dodgers organization. 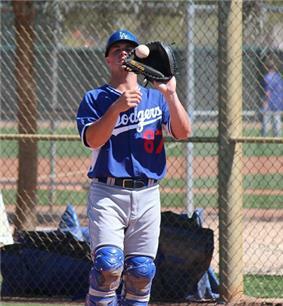 Shawn Zarraga (born January 21, 1989) is an Aruban professional baseball catcher for the Los Angeles Dodgers organization. He was drafted by the Milwaukee Brewers in the 44th round of the 2007 MLB Draft out of Trinity Christian Academy in Lake Worth, Florida. He began with the Arizona League Brewers in 2008 and then split 2009 between the Helena Brewers and Wisconsin Timber Rattlers. He was promoted to the Advanced-A Brevard County Manatees in 2010 and spent the next three seasons there before a 2013 promotion to the AA Huntsville Stars. In late 2014 he was promoted to the AAA Nashville Sounds. On December 18, 2014, he was traded to the Los Angeles Dodgers in exchange for minor leaguers Jarret Martin and Matt Long. The Dodgers extended him an invitation to Major League spring training. Zarraga split 2015 between the AA Tulsa Drillers and AAA Oklahoma City Dodgers, hitting .286 in 62 games.